Since the development of our smartphones and the games we play on them, one of the most downloaded and played games are certainly the shooting and action games. Because thousands of these games can be found, choosing the right one that will give you the excitement and action you are looking for can be quite time-consuming. No worries though, we did our research and we have for you an incredible shooting game with all the action you need. Let’s discuss it. 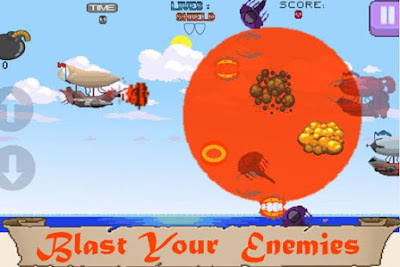 Developed for android users as one easy to play and yet challenging and exciting arcade shooting game, this action game offers all shooter addicts to enjoy flying and battling, shooting their enemies down and becoming a hero of the battle. With great HD graphics and amazing sound effects and music, players will enjoy playing while using simple and intuitive controls for flying in their airship or sky-ship. Because the game is all about the action, players will get addicted on their first try, getting endless fun and excitement, battling, shooting and flying, taking their enemies down to win it. What are the best features of SKYSHIP HERO? The SKYSHIP HERO is offering all shooter addicts and action players amazing features that will keep their attention and get them addicted to the game fast. With the game, players will test their skills of flying and shooting, trying to become heroes by flying in their sky-ship or air-ship, shooting the enemies that are blocking them and trying to take them down. The battleship of the player goes against the one of the enemy and the player will use the virtual pad for going up and down to control his battleship. For shooting the enemy, the player can tap the enemy to aim and shoot him or even use a bomb to blast it and take the enemy down. Various level designs are offered such as the ocean, the sky and the space and the game offers enjoyment for both beginners and hard-core shooter players. Simple and yet challenging game rules, players on the game are offered multiple extreme boss battles and 8 different bosses with rich attack patterns. Minutes of challenges, excitement and fun packed with 7 levels of endless action are offered so the player can enjoy shooting and battling his enemies to become the hero of the game. Download the game on Google Play for free to fly and shoot enemies and be the hero of the battle!